SQL is a widely used to access most databases, therefore database developers and system administrators should be familiar with it. 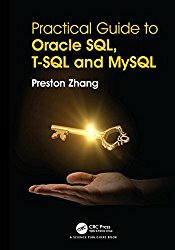 This hands-on SQL book will help beginner and intermediate users to write queries that apply complex conditions on a table. The book's unique side by side approach makes it easy for the reader to learn three major query languages in the IT industry. The author has over 20 years of experience in database design.KEY FEATURES:Contains numerous practical screenshots of Oracle SQL, T-SQL, MySQL statements and results.Shows the differences between Oracle SQL, T-SQL and MySQL side by side.Gives a real world experience for SQL developers and database administrators.Sample data is available to work on (available on our website).